DFB author Wendy tempts us with treats from The Mara at Disney’s Animal Kingdom Lodge in Walt Disney World! 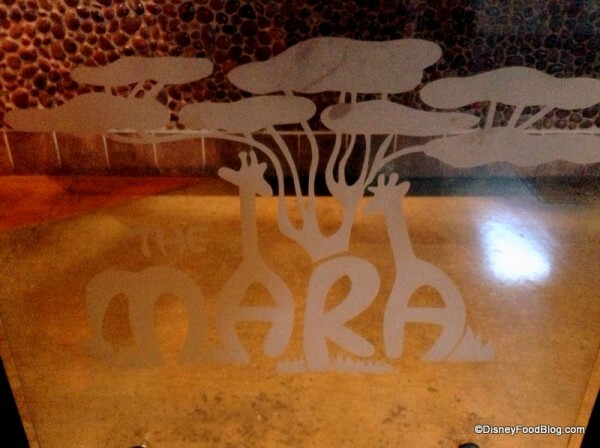 Steps away from the Uzima pool at the Animal Kingdom Lodge and head over to The Mara! 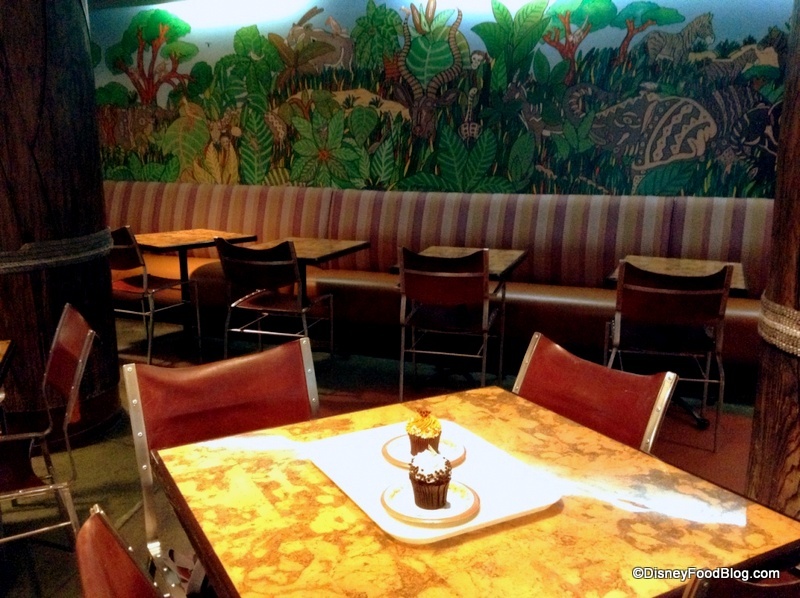 This awesome counter-service spot is a hidden gem, and well worth your time to head over to AKL and explore. 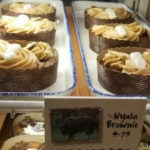 We’re always impressed with the offerings here — many of which have an African flavor — and they’ve surprised us again with some unique desserts in the bakery case! Let’s head over and see what we can find… . Located on the bottom level of Disney World’s Animal Kingdom Lodge, the Mara has a nature-ific theme — including “trees” that grow up onto the ceiling! 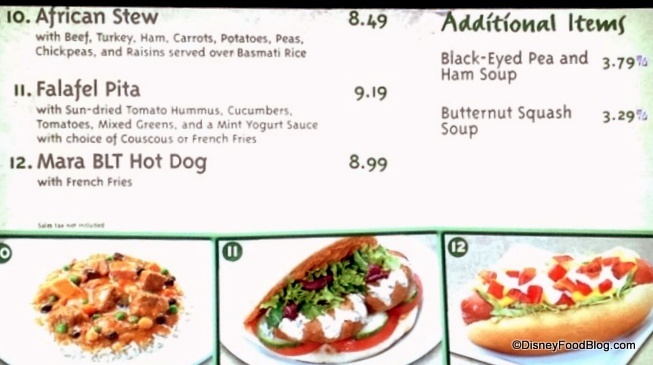 The Mara has earned its reputation for some truly unique quick service options: African Stew, a rotating array of soups, and the Falafel Pita, to name a few. Previously, though, The Mara Bakery has flown under the radar as a spot for unique desserts. 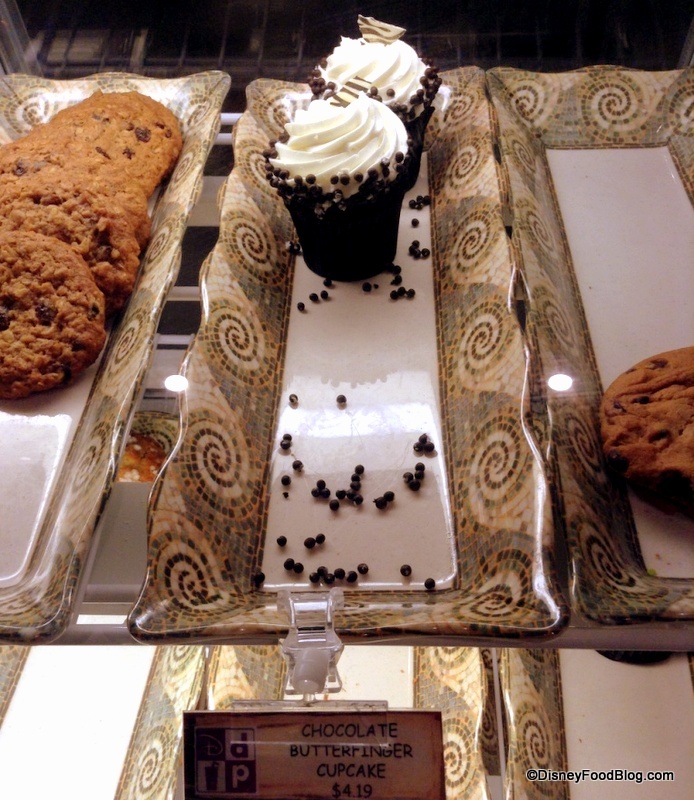 Though you can certainly find some awesome items in The Mara’s chilled grab-and-go section (HELLO, Zebra Domes! 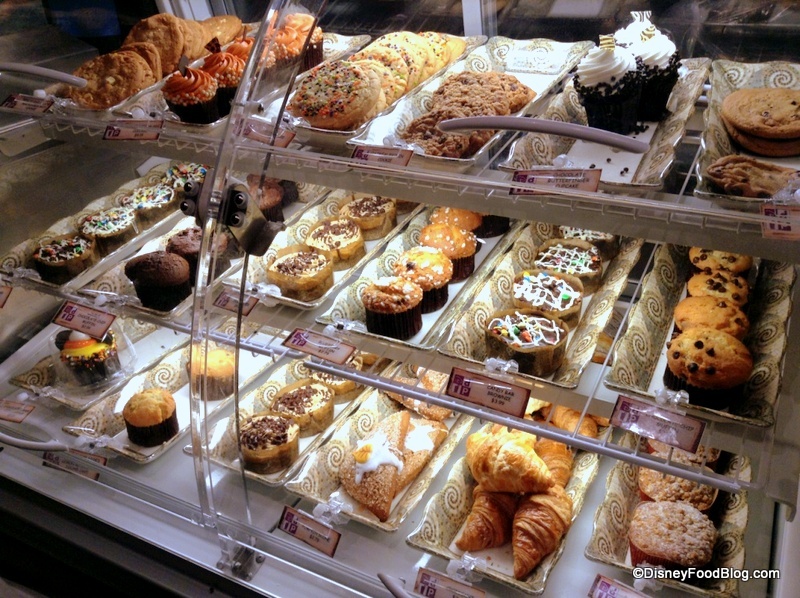 ), the bakery case itself often seemed to feature items that are standard across Disney Resorts, especially in comparison to spots like the Contemporary Resort’s Contempo Café or the Polynesian’s Captain Cook’s, where one can often make a new dessert discovery. So it was with some excitement that I went in to sample the Zebra and Giraffe Cupcakes, unique to The Mara! 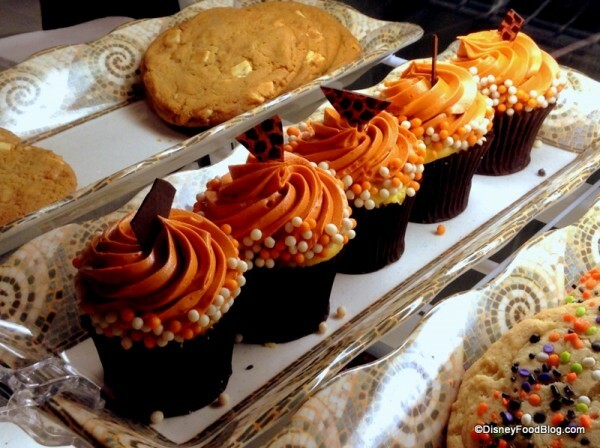 I must say, while my visit was intended for the cupcakes, it was a little difficult to stick to the plan when my gaze fell upon the Peanut Butter Brownie, and the Chocolate Candy Corn Cupcake complete with Oreo Mickey Ears (this one, of course, being unique to the Halloween season)! 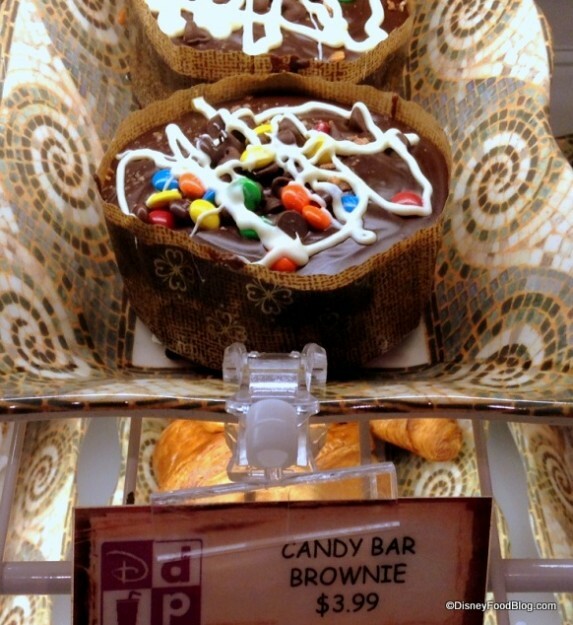 Oh, and by the way, Candy Bar Brownie… one day, you WILL be mine. Even among these happy distractions, however, I was able to regain focus rather quickly, thanks to the awesome presentation of the Zebra and Giraffe Cupcakes. These would stand out in any bakery case! 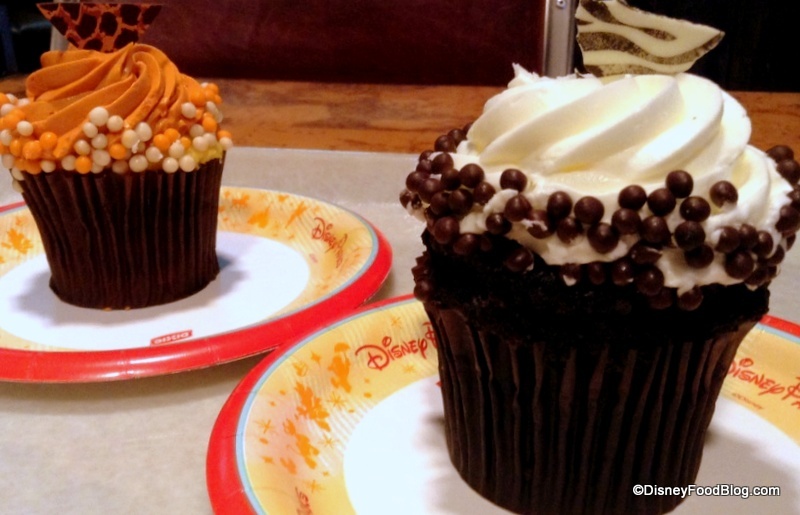 I love how the animal themeing of these cupcakes help them fit right into their surroundings! 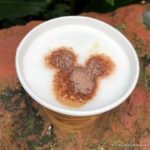 Right off the bat, it should be noted that The Mara’s Zebra Cupcake is NOT the same Zebra Cupcake that you may have enjoyed previously at Animal Kingdom. 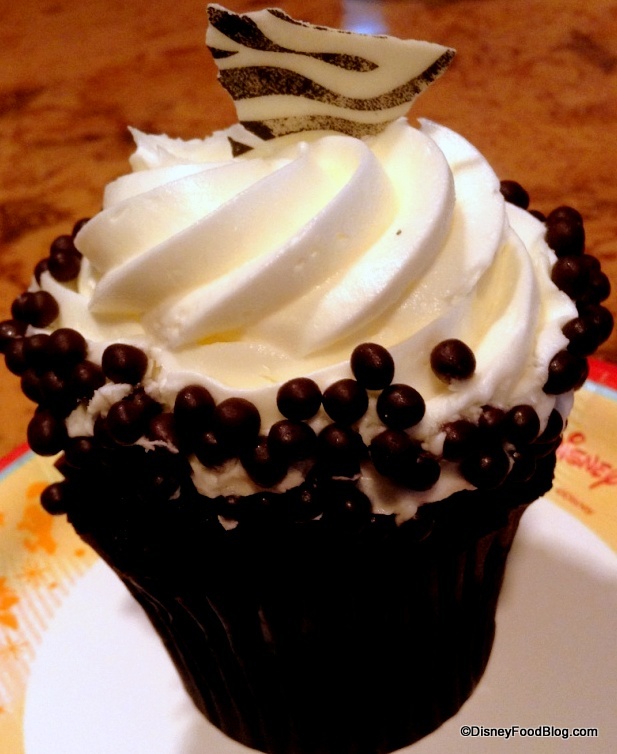 (And to those of you who became understandably excited when you read the name of this cupcake, I offer my apologies!). 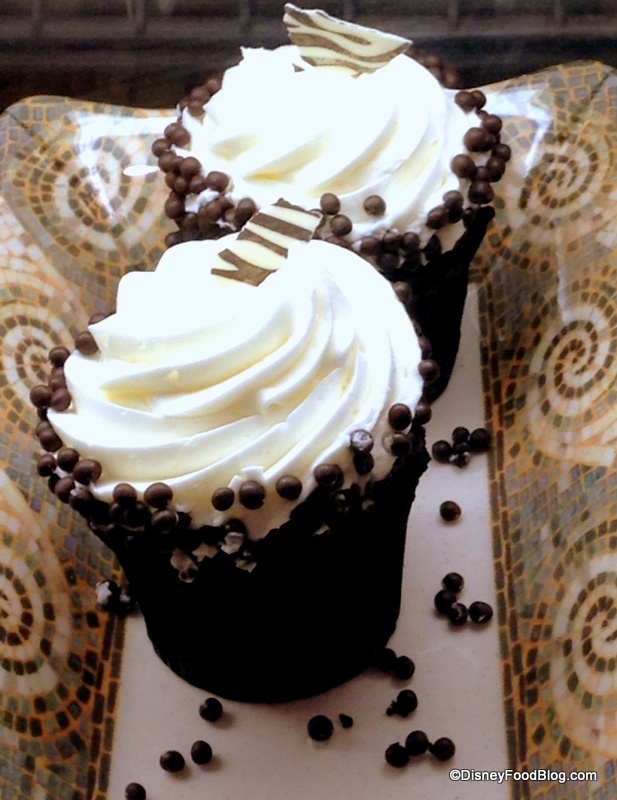 Considered on its own, however, this Zebra Cupcake is exactlywhat a cupcake themed after a zebra should be: a mix of white (vanilla) and brown-black (chocolate) representing the black and white (or is it white and black? 😉 ) stripes on a zebra. The cool zebra-striped topper is white chocolate, while the crunchy brown garnish bits are milk chocolate; and they bring a nice crunch and texture to the frosting. Speaking of frosting (and shouldn’t we always be speaking of frosting ;)? )… It’s pure, sweet vanilla. 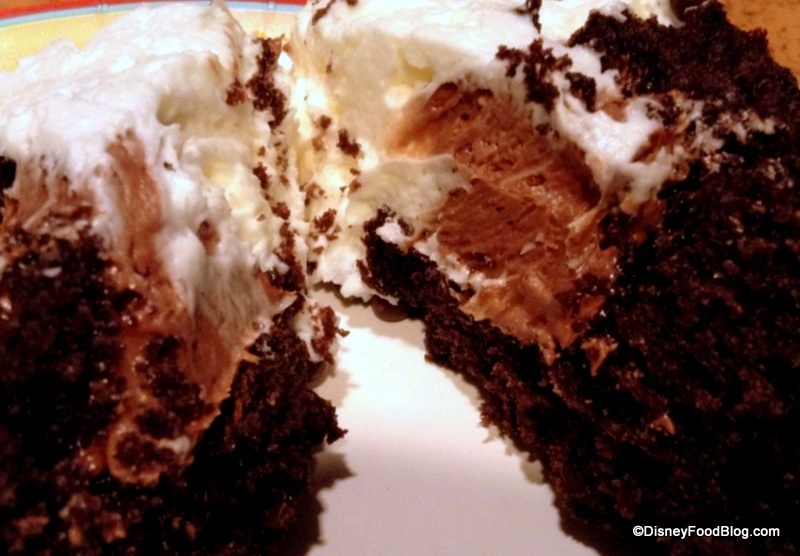 Inside the moist, chocolate cupcake base is a mix: the vanilla frosting from the top dips down into the center, but is complimented by its opposite: a dollop of chocolate frosting is in there, too! 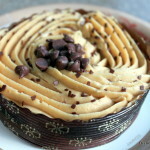 Even with the presence of the vanilla frosting, I’d say this one is definitely for chocolate fans. Here is the one issue I had with this cupcake: the sign. Well, I poked and prodded and sniffed. I consumed every element of this cupcake individually and mixed all together to see if I could detect the slightest hint of Butterfinger taste anywhere… but I just couldn’t. 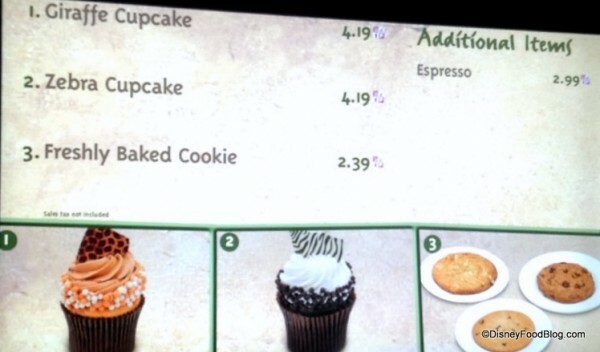 I don’t believe the sign was mistakenly placed because I’ve seen it once before right in front of this very cupcake. Perhaps the flavor was there, but too subtle to taste? I don’t know. 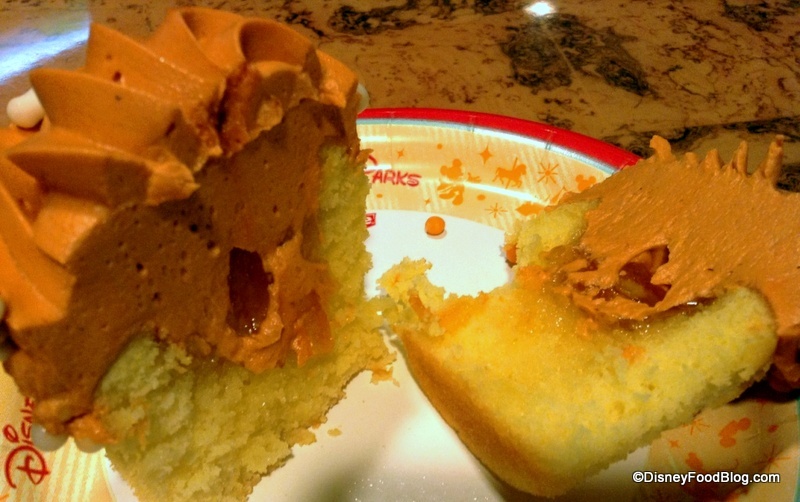 The thing is, this is a darn good cupcake. But those excited by the label (as I was) risk disappointment. The beautiful dark chocolate giraffe-printed piece sits atop very bright orange frosting. The frosting on this one, despite its color, is also vanilla, but dotted with yummy orange-flavored garnishes. Fancy! Second only to its spectacular appearance, the yellow cake base, for me, was the other real standout. It has just the slightest hint of tangy orange citrus flavor to provide a subtle taste of orange without being overpowering. When eaten with the vanilla frosting, it has a really delightful creamsicle taste. YUM!! Typically I’m all about what’s filling the cupcake, but here, the cake was the definite winner for me. There is certainly filling, though, and this is where the cupcake earns its Orange Marmalade label. My honest, initial reaction? “Bummer.” I learned from the Peanut Butter and Jelly Cupcake that I am not a fan of the jelly-and-cake combo. It sort of trips me out. But here is where the Giraffe Cupcake gets it right: the Marmalade is chock-full of orange chunks, so while the jelly consistency is still there, it serves primarily as a binder for the orange pieces. 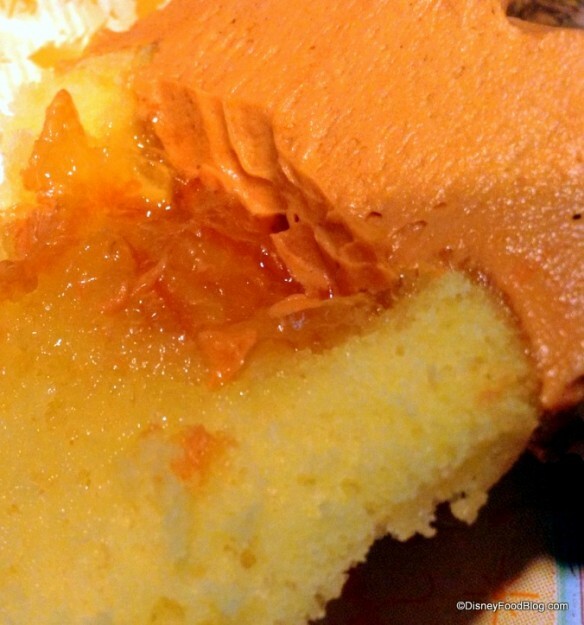 So in actuality, even though the feature flavor is orange, the texture brought to mind a Pineapple Upside-Down cake. 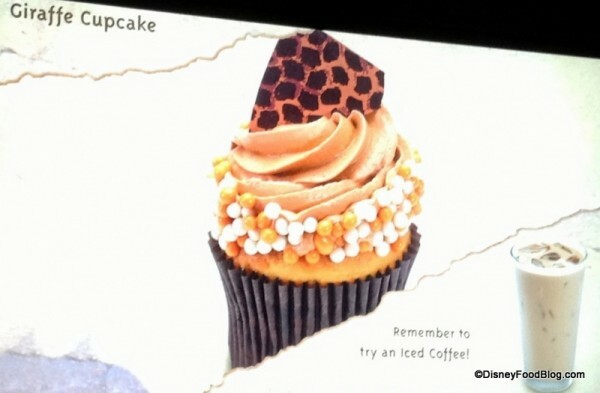 I don’t believe I’ve ever used this word to describe a cupcake before, but the Giraffe Cupcake is actually quite refreshing. It could be an excellent choice for someone searching for something a bit lighter (in taste, not necessarily in calories 😉 ) for their dessert, and I’m curious to hear what others think of this option! 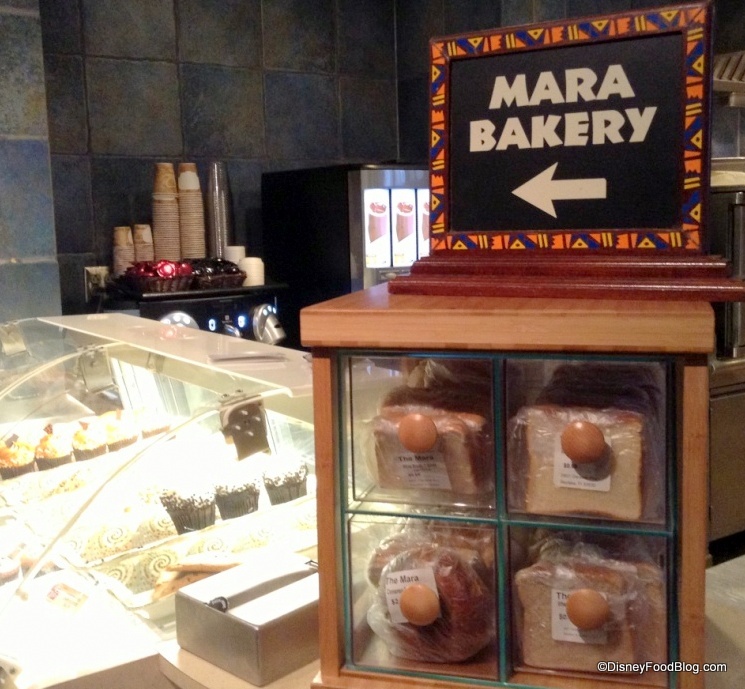 It will be fun to see if The Mara continues to expand its Bakery selections, as they’ve proven that they can definitely step outside the norm and take a walk on the wild side with these new additions! Do you enjoy themed treats at the Disney resorts? Let us know if you’ve seen any unique eats lately. Share your thoughts in the comments section below! 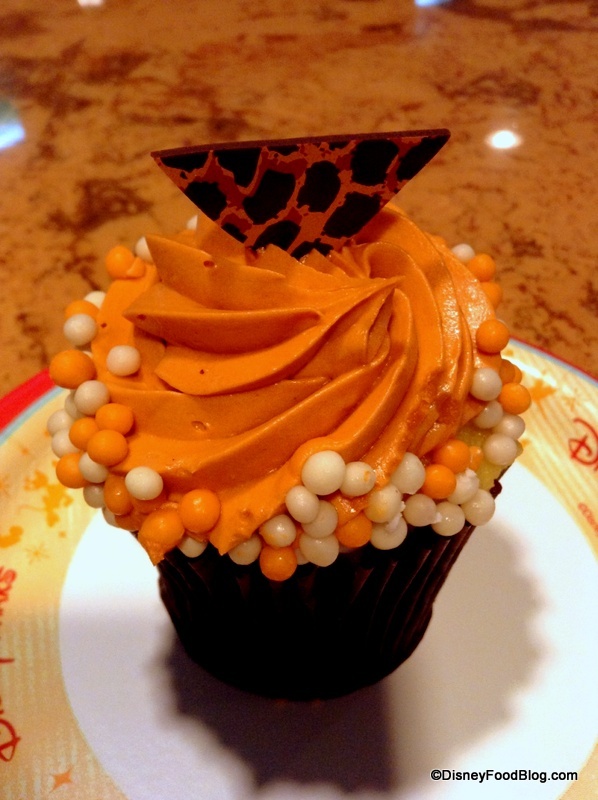 Be sure to check out more great Disney Cupcakes here! 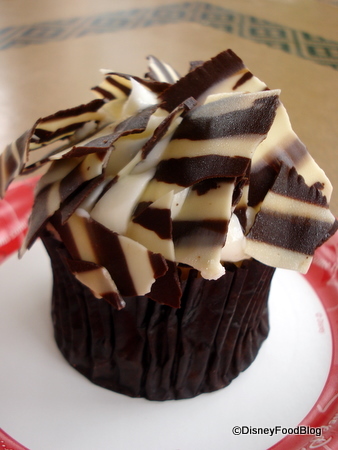 I’m a fan of all things zebra, so that zebra cupcake moves to my must-try list. But honestly, it’s the giraffe cupcake that looks out of this world! Thanks for the review. With as creative as Disney is, it surprises me that they don’t use a marble cake for the Zebra cupcake to give a more stripey feel throughout the cake itself. Regardless of this, thanks for the review! 🙂 All of these desserts look delicious! Mara is probably my favorite resort counter service. 🙂 I eyed those cupcakes when I was last there. You are correct about the butterfinger cupcake sign. It was there last May. For some reason, we decided instead to do the babycakes brownie bites. What a mistake that was!!!!!!!!!!! 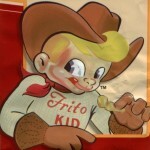 But you made me feel better because I would have felt gypped with no butterfinger to be had! Plus, let’s face it, after the african stew and chicken flatbread, I probably didn’t need it. What I would recommend for dessert: deluxe resort pop: Pibb Xtra!!! 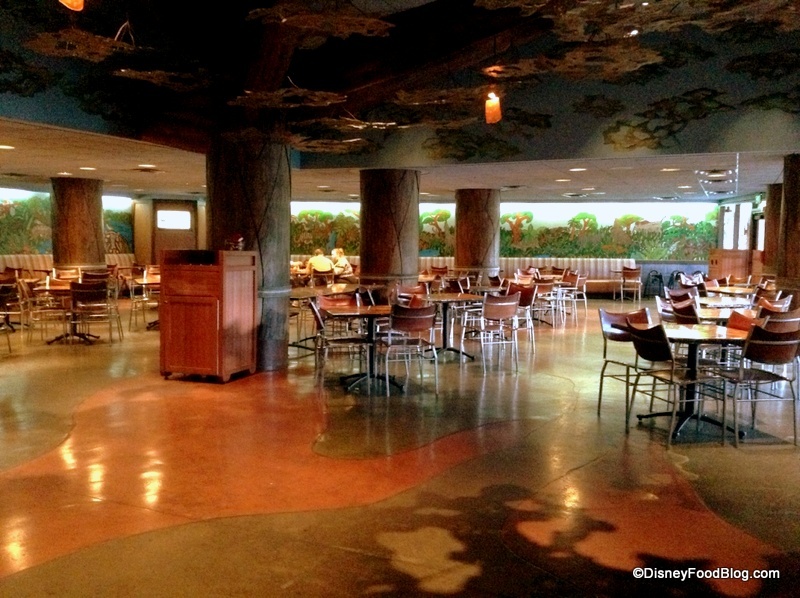 Yes, resort and park especific food and treats should be a must for Disney. It’s great when the desserts are not generic like the ever-present chocolate and carrot cakes. 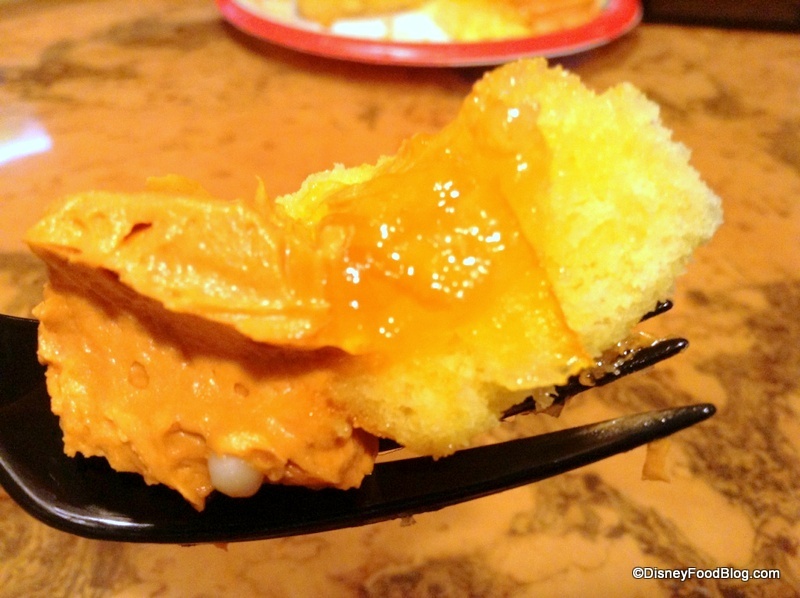 It’s fun when you know you’ll find Tonga Toast only at the Polynisian Resort, Tie-dyed Cheesecake only at the Pop Century Resort etc. We stayed there last week. 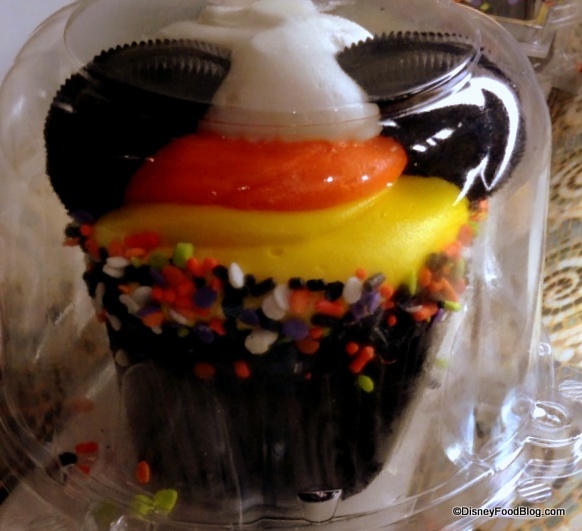 I split a peanut butter brownie with my husband, and it was yummy, but the surprise winner was that candy corn cupcake. My daughters split one and I sampled it as I cut it for them and, man, was it good! 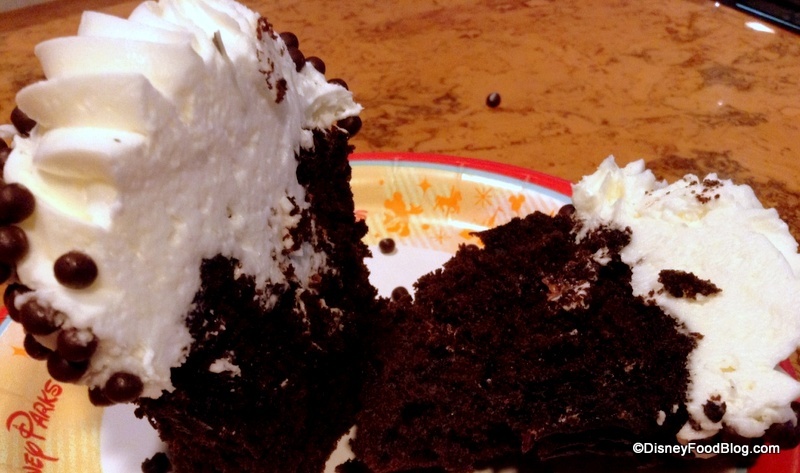 I expected it to be dry, but it was moist and fudgy cake and the icing was thick and creamy and delicious. I was so tempted to get one all for myself. 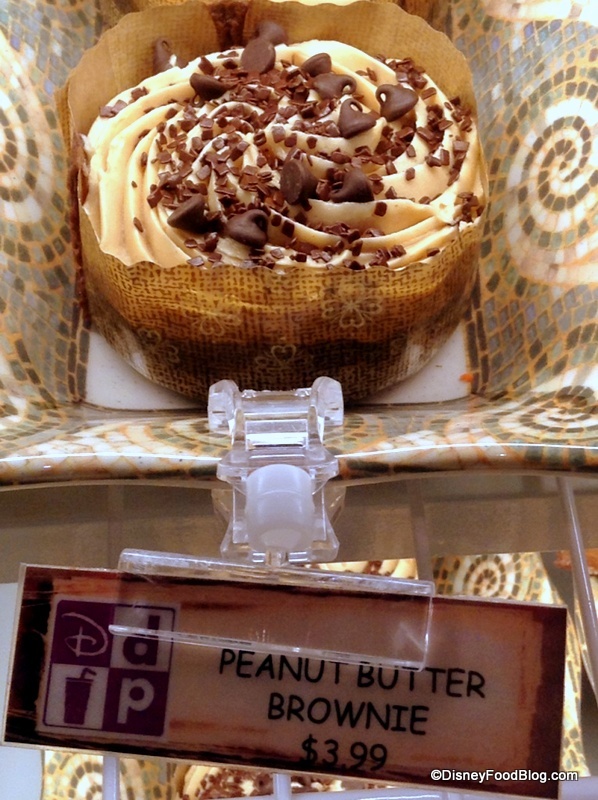 We’ll be back at our DVC home resort (AKL) in less than two weeks and absolutely cannot wait to try these cupcakes and that Peanut Butter Brownie (drool). The Mara is such an unsung hero of WDW. I concede that the quality of the food seems to rise and fall seemingly without any real explanation (truly hit or miss), but you can’t beat the location, and the staples never disappoint. I mean, seriously, access to Zebra Domes at any time of the day or night is Heaven on Earth for me. 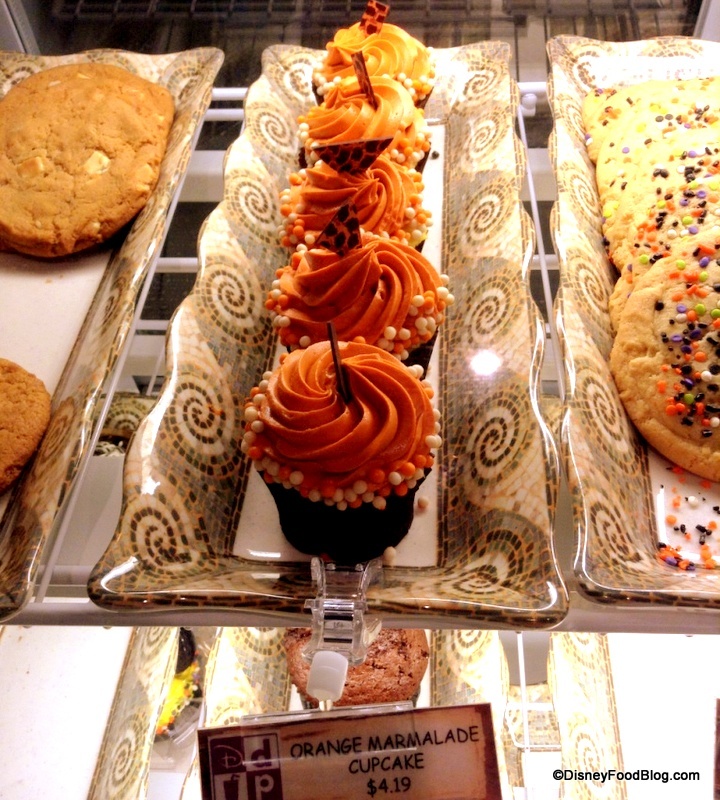 That Orange Marmalade cupcake looks amazing! Can’t wait to give that a try next trip!